Relive the fun of yesteryear! 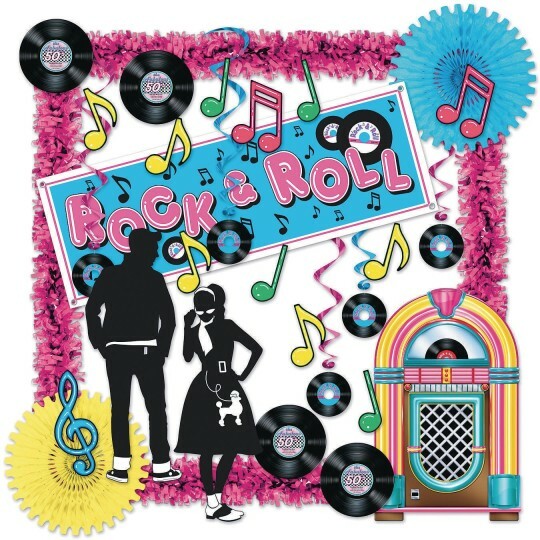 This 30-piece rock & roll sock hop decorating kit includes tissue festooning and fans, a 5’ long rock & roll all-weather sign banner, 40” rock & roll record whirls, musical note cutouts in assorted colors and designs that measure from 12” to 21”, 1950’s silhouettes that measure 34” and 36-1/2”, a 3’ tall jukebox cutout, and 13-1/2” inch record cutouts. All cutouts and the silhouettes are printed on both sides of boardstock paper.